WDM media converters (Wave Division Multiplexing) transmit and receive data over one singlemode fiber strand (simplex) instead of over two fibers (duplex), as found in most media converters. This technology is also referred to as BiDi or Bi-Directional. These use singlemode fiber and typically are for longer distances. This capability is typically used to have more data circuits in a given fiber cable. This may be to optimize the data over a given fiber cable, to expand data capacity beyond what an existing cable can handle with duplex circuits, or to reconfigure a partially damaged cable to handle the required data over fewer fibers. All these WDM media converters require singlemode fiber. Units with 20km (12.4mi) and 60km (37.3mi) capability are offered here. 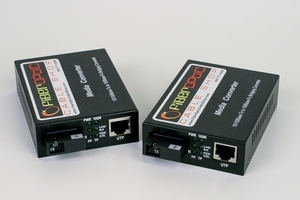 These WDM media converters are sold as matched pairs and the prices shown are for two units.